“Are you game for a different cake this time?” I asked Ro, on the eve of his birthday.“Why not?” he replied. Catering to his specific tastes, I had always made plain cakes with cream and fruits (read Lychee and Strawberry Cream Layer Cake) or Chocolate Cakes with Ganache and exotic fruits for his birthdays in the past. Once I got my affirmations, my mind set to work. I have always been creating a special cake for him on his special day and I had no mind to break the tradition. But this time I had some limitations. Time was the biggest. I didnt have any on hand to spend hours on an elaborately decorated festive cake. Afterall I have a baby who constantly (read 24 hours) needs my attention. I had to make a lovely cake with the restrictions and the limitations. 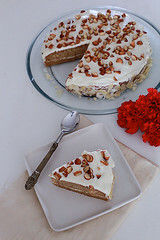 I truly adore almonds and decided to make a cake highlighting them, hoping that he would like it too. While deciding on the base cake, I made up my mind to do a cake with condensed milk. A celebration cake without “this can of sweet nectar” is a strict “no, no” for me. Condensed milk adds richness, flavour, taste and gives the best texture to an eggless cake, besides adding the required sweet touch. 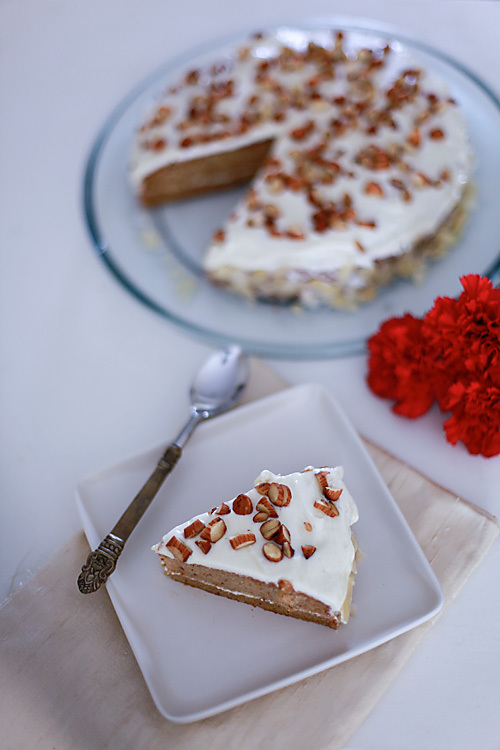 This almond cake serves as a beautiful and wonderful dessert, perfect for any special occasion. It looks pretty and doesnt require ample cake decorating skills too. I promise you it is quite easy to put together. Also you can think of various permutations and combinations here. Chocolate Cake with Almond Buttercream Icing or Eggless Almond Cake with Chocolate buttercream frosting are some of the endless possibilities. Since this cake is soaked with a syrup, it tastes best when chilled. I like to use salted butter for the icing which tastes great, but feel free to use unsalted butter if you dont like to use salted butter. Place the almonds In the bowl of a food processor fitted with the metal blade or an electric coffee mill and pulse until finely ground. It is important not to over grind as you would end up with almond butter instead of almond meal. Grease and line the bottom of a deep 9” round cake tin with greaseproof paper/baking parchment or butter paper. Alternatively use 2 9” round shallow cake tins and divide the batter accordingly. Preheat the oven at 150 degrees centigrade. In a mixing bowl, assemble the flour, baking powder and baking soda, mix with a spoon and sieve once to make the mixture uniform. Stir in the almond meal into the flour mixture. In a large bowl assemble the liquid ingredients the melted butter, condensed milk, water, almond and vanilla extract and using a hand blender beat until well mixed. Add half the flour mixture and beat again. Put in the remaining flour mixture and beat until you get a smooth batter without lumps. Dont over beat the batter as this would interfere with getting a soft cake. Pour the batter into the prepared tin and bake for about 45 minutes or until a skewer inserted in the middle of the cake comes clean. In a mixing bowl, cream the butter and sugar. Put in almond extract and enough milk to get a firm but soft buttercream. In a small saucepan, place the water and the sugar and bring to a boil over a medium flame. Allow to cool. If you, like me baked the cake in one 9” round deep cake tin then you need to slice the cake into two equal halves. Place the bottom half of the cake on a serving dish. Pour some of the soaking syrup to wet the cake. Spread 1/4 of the icing and a little of the chopped and toasted almonds over it. Place the remaining half cake over this, pour a little more of the soaking syrup over the cake and spread with the remaining icing. 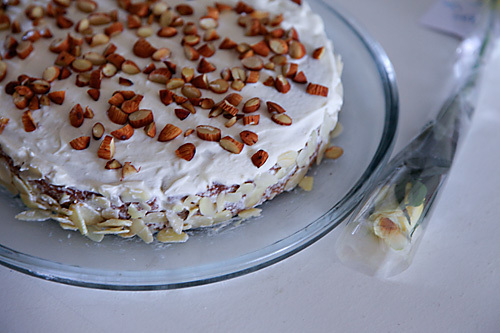 Arrange the remaining almonds decoratively over the cake. *The icing quantity can be doubled for more elaborate icing. splendid pics …and great cake..its amazing how u've managed to create something so beautiful inspite of pressing demands…kudos! The cake looks really interesting. If with limitations in time you can make this awesome cake I wonder what you can create when you have time at your disposal! 🙂 Wonderful presentation Anu, I can almost taste the almonds! Preethi: How I wish I could share it with you. Asha: You are so right! This cake is "perfect" for a celebration. This looks great! 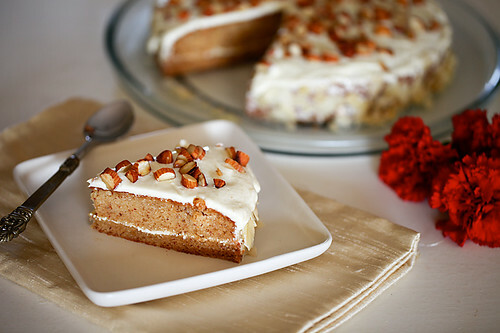 I think I might make this, my mom loves almonds =) Thanks for the recipe! Happy Bday to RO…cake looks yumm! Awesome cake! Just wondering if I could use almond brand to make the cake. Thank you! This is truly awesome! I love almonds and this is surely a must try recipe. Belated wishes to your hubby too. The cake looks delicious, even though I'm not a fan of buttercream!! Made this cake for my dad's birthday today! It was a big hit with my folks!! They say it's one of the best cakes I've ever made! Gauri: Fantastic! I'm so happy this cake made you and your loved ones happy! Now planning few of the curries and vegetables for the evening from your collection!! Mithy: Were your almonds ground into a powder or had they turned pasty? Using dry almond powder is key to get a soft and moist cake which is not oily. Also, if you decided to make these into cupcakes, for how much time did you bake them? Cupcakes need less time in the oven in comparison to regular cakes. Actually, I used 50 grams of ground almonds (the one from the store). I did not grind it myself. I don't see in the recipe where this ground almond is incorporated. I presume that it should be blended with the flour. Mithy: The almond needs to be stirred into the flour mixture as the recipe states above. I just wanted to thank you so much for this recipe. I have tried so many before but none were so perfect as this one. My kids loved it. I did modify the list a bit. I used 1/2 tsp soda instead of 1 tsp. And I used total 1 and 1/2 cup of flour (no almond pieces). I loved the cake. Thank you very much for sharing. thank you so much for the recipe. My son has numerous food allergies including dairy, eggs, and wheat. Do you think i could substitute rice milk or coconut milk for the condensed milk in your recipe and buckwheat flour for the plain flour? I would really appreciate your thoughts. His birthday is on the weekend and i would like to try this cake—thanks again! Bama: Sorry for the delayed response. Unfortunately, these substitutes will not work here and will affect the texture and taste of the cake. Glutenfree cakes need a binding agent and I'm yet to test a recipe for the same. Hi !! i made this cake today without the icing and it turned out to be deliciously yummy !! All warm and almond flavor..Thank you so much !! Swheta: Great! Glad you enjoyed it. Hi anu i baked this cake yesterday and it is very tasty,i had to struggle to get the icing part a lot,but then it worked.my daughter likes all types of cakes but my son is more particular of chocolate cakes,,so i am having a variety at home while i bake..
Hi I baked this cake and my family and friends loved it..came out perfect. I baked it in two lots in 6 inch pan to give it height and it looked just perfect after the icing and decoration. Thanx for the wonderful recipe. Josna: How wonderful! That is one of the most gratifying things about baking..making your loved ones happy! Belated birthday wishes to your dad! This is a brilliant recipe. I sort of like it more than the one with egg. Turned out really soft and delicious. I am a huge fan of almonds and it just makes my life so easy. 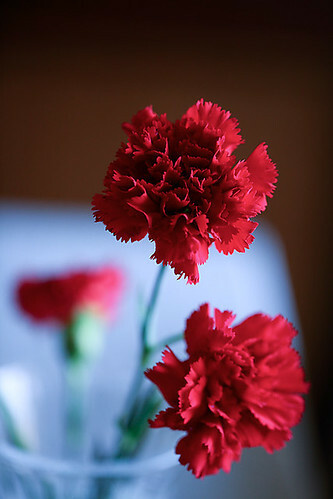 Three cheers!! Himanshu: That's nice to hear! Glad you enjoyed it! Hi this is a good recipe. Just had 1 question can I use amul cream instead of butter in the icing? Thanks. bhagyashree: No you can't use amul cream in this recipe. If you want to use amul cream use my pineapple cream cake recipe. Thanks for sharing such a wonderful recipe! Just a query: I have already got ground almond powder. You have used 1/3 cup of almonds and ground them in a processor. After making a powder did you still use 1/3 cup of ground almond flour or more than that? could you please give me the exact amount of ground almond flour that you had mixed with the plain flour? I've used this recipe but it didn't turn the way I expected. European almond cakes are dry inside, they're dense and rich but this recipe makes the almond cake too moist (inside & outside both). I've taken a picture of the cake using the above recipe before soaking syrup & cream steps, if anyone wishes to have a look. Genuine almond cakes are soft, yellowish colour and drier inside unlike this one.Make any search on Google and you'll get a picture of a genuine almond cake. I think we vegetarians need to look more and more before coming with a genuine eggless almond cake. Karishma: I have not made any claims whatsoever that this is a European inspired cake. This is my take on an Almond cake for a celebration and it is not meant to be a Tea cake which the European almond cakes usually are! And the yellow colour that you are referring to in European cakes comes from "egg yolks" which we are not using here. Needless to say this it takes a lot of time, energy and efforts to develop eggless recipes and put them in the form I have over here and I'm happy when my readers acknowledge the work that goes behind the scene. I wouldnt change a thing of about this recipe and I remember people who ate it saying it is one of the best cakes they ever ate. Besides, this has also been tried, tested and loved by others as attested by them in the comments. What purpose does the soaking syrup serve? Is it because the cake is dry? I am hesitant about doing this because I am scared it will be too sweet? Tanvi: All wet cakes have a soaking syrup which makes the cake moist and flavourful.. Don't worry about the cake being sweet..go ahead and try it! You might love it. Wonderful recipe, want to try it soon, just a query can I use store bought almond meal. Shilpa: Almond meal will be a little coarse. Try and use Almond flour. If you have almond meal then just grind it into a fine powder. Hi Anu, Lovely recipe as usual. I'm quite excited to try making this cake . However I dont have almond extract. What can be used as a substitute for almond extract??? Radhika- there is no substitute for almond extract. You can replace it with vanilla extract. Hey everyone….just trying this recipe today keeping my toddler girl in mind….one question…what should be the oven temperature? Preheating at 150 is fine..what about the one later? Deeptu: The temperature continues to be the same after you put the cake into the oven. Anushruti is this icing good enough to frost the whole cake generously? Saranya- If you want a generous frosting, then maybe you should make more icing. Replacing the almonds with pistachios for a pistachio cake – do you think about it would work out ? I meant will it have similar results? I tried this cake, but it turned out as if there was a bit excess of liquid. What should be the consistency of the final batter when you make it? Is it of dropping consistency / a bit runny / creamy? Also here is tip I got from Joy of Baking to ensure we get almond meal and not almong butter : Pulse the almonds with a teaspoon of sugar! Your recipe is awesome. I made it on janamastmi with a few changes . It turned out moist n yummy. Wanted to post a pic of the cake as a mark of gratitude but culd nt find the option. God bless! Today again i baked the cake but used 3/4 th milkmaid tin n 1/4th caramel sauce with butterscotch essence . I have glazed it wth caramel sauce n it turned out to be a big hit in the home. riti- Thanks! You can send the picture to me via facebook divinetaste page or mail it to me via the contact page. Look forward to seeing the pic. riti- Use smooth icing sugar or confectioners sugar. You will have to triple the recipe. Bake in 3 pans or 2 pans. Baking time and temperature remains same. If cake is not baked when a skewer is inserted then bake for 5 to 10 minutes more. Can I use wheat flr instead apf? And waiting for lychee strawberry cream cake……. Plzz share . I don't think you need 3/4 cup of water. You'll need just about a few tablespoons to a 1/4 cup of water or milk if you want the batter to be right. Else the cake will fall. Poonam: Yes, you can try using wheat flour but it would be dense and the texture wont be the same. Swan: 3/4th cup water is the right amount for this recipe if you measure the other ingredients correctly.